Provide comfort for the family of Eldon Voss with a meaningful gesture of sympathy. Eldon Herbert Voss, 86, died Sunday, February 10, 2019 at Grace Pointe. He was born December 17, 1932 in Worthington, Minnesota to Harm T. and Ella Hilda (Bottin) Voss. 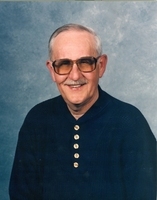 Mr. Voss attended public schools in Worthington and graduated from the University of South Dakota. In 1952, he married Ruth Ann Peters in Worthington, MN. He was employed by Central National Insurance Company, Home Insurance Company and later State Farm. He finished his working career with United Artist Theatre Circuit, retiring in 1996. Eldon was a member of Our Savior’s Lutheran Church. Survivors include his daughter, Colleen K. (Dennis) Mau of Greeley and son, Herb of Greeley; brother, Tom (Helen) of Windom, MN and numerous nieces and nephews. He was preceded in death by his wife and a son, Tony. Life Celebration Services will be held at 1:00 p.m. Thursday, February 21, 2019 at Adamson. Private inurnment will be held at Sunset Memorial Gardens at a later date. Memorial gifts may be made to the “Weld County Humane Society” in care of Adamson, 2000 47th Ave., Greeley, CO 80634. We encourage you to share your most beloved memories of Eldon here, so that the family and other loved ones can always see it. You can upload cherished photographs, or share your favorite stories, and can even comment on those shared by others. Provide comfort for the family of Eldon Herbert Voss by sending flowers. I will always fondly remember him as a great dad and as someone myself and Herb always tried to avoid as much as possible. That's because we were usually up to no good and he always seemed to know that. I didn't appreciate it then, but I certainly do now. I was saddened to hear of his passing. RIP Mr. Voss. If I had a question about insurance or investments I always knew I could count on Eldon for good advice. He worked in those fields for years and you could always count on him. He was a good father and loved his family and always took good care of them. When any of his offspring needed his help he was there. He loved Ruth his wife very much and was there for her to the end. He researched everything very well before he made a decision and he kept perfect records of all his purchases and transactions. As Frank Sinatra said Eldon truly did it his way. He will be sorely missed.